We continued our tradition of having a last lunch for the Fort Lauderdale district on the Tuesday before transfers. By then they know who is going to be transferred but not where. 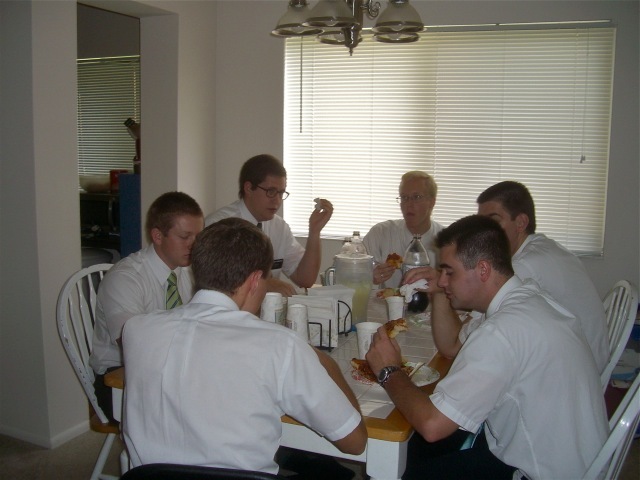 We had six elders arrive – we still have not had Elder Fitts and Rippstein to one – and they got to eat a fair share of the pizza before the eight sisters came. Now actually there are not any sisters in the FL district this transfer but we have always invited the sisters who live across the street from the Waves to come and this time they asked if they could bring some of the other sisters in the zone and so we had a nice group of sisters – including sister Pack who was heading home on Thursday. 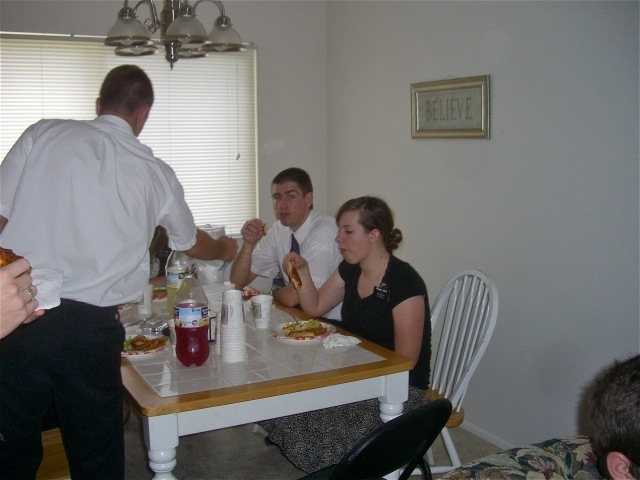 They seemed to greatly enjoy the garlic bread – elder Plowman seemed to always have a piece in his hand and sister Dye commented on how good it was a couple of times – and they even cleaned out the green salad which does not always happen. We fed them home made brownies – I think brownies are the dessert of choice for most mission meals – and then shooed them out so we could get back to the office and get more done for transfers. The elders gathered around the table until the sisters came. 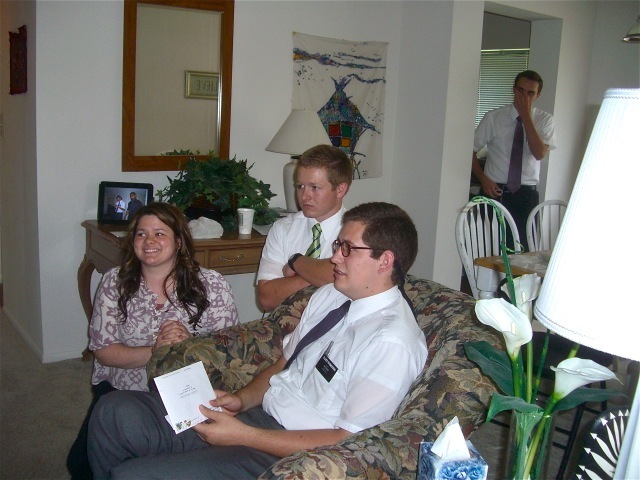 In the middle is elder Wilson and sister Smith. 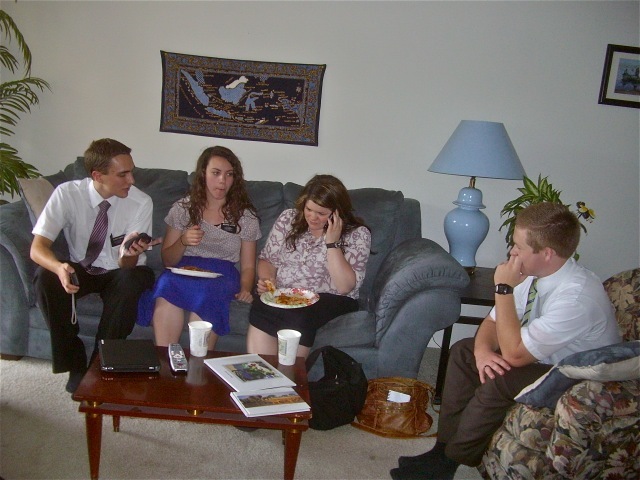 Sister Carnes, Perry and Smith with elder Wilson – he was not going to give up his place at the table. Notice that sister Pack is busy on the phone even as she eats. 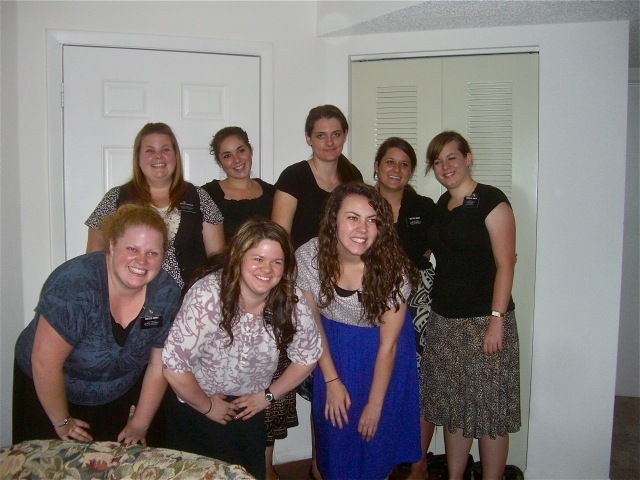 Elder Rasmussen – closest to the camera in the middle picture was transferred to Miami Beach Zone – Sister Pack and Elder Marsh. We will miss his always cheerful attitude and great smile. 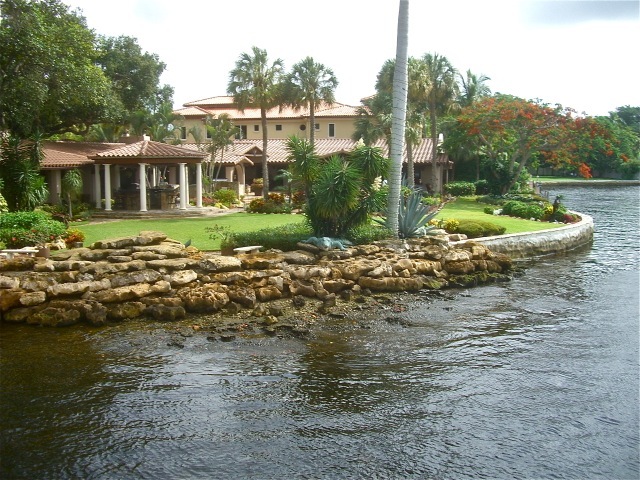 He will be serving in the Miami Shores area. All eight sisters in the Zone – back Lavoie, Carnes, Dye, Geest, Smith, – front Perry, Pack, Andrus – one last picture before some are transferred or go home. But most of them will be serving in the area for another 6 weeks. 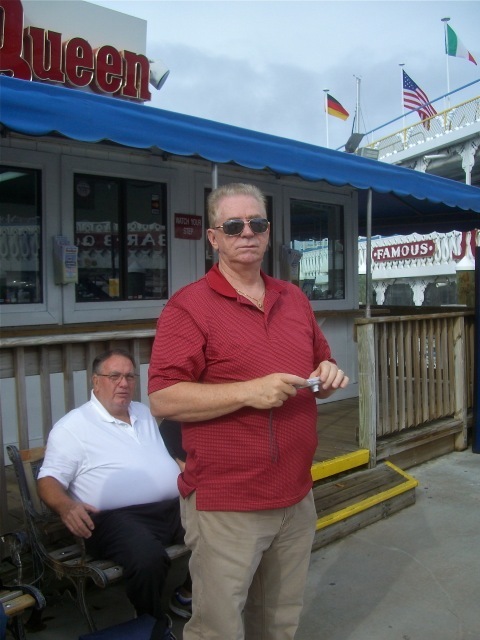 This entry was posted in Fort Lauderdale Mission on June 30, 2012 by Bill. 5 of the days were very busy, 2 were pretty busy, and the other three were not so much. Transfer week is always a busy one for us – especially Mary. We get the “final” transfer report from the assistants on Monday – it is usually sitting on our desks when we get in – and then we can get things moving. Mary actually gets a heads up on Thursday or Friday about those who will have the opportunity to serve for the first time as District Leaders, Zone Leaders or Assistants so she can start getting letters out to the missionaries parents and PH leaders. There are also a series of letters for the missionaries going home and those coming in. All in all she gets to write and post a lot of letters. I started to write all the other things that she does for a transfer but I got tired and will leave it at that. My task is much easier. All I need to do is make up a transfer scenario that shows the new organization of the mission, get ever missionary with the right companion, in the right area, district, zone and with the correct calling. It sounds harder than it really is but I still manage to make mistakes. However this time I only had two corrections with my first attempt. I have the assistants look over the board and make sure everything as they should be. Once the transfer is finalized – this means that Salt Lake has it firmly in their servers – I can sync it with a wonderful program called ‘Establishing Zion’ that was developed by Elder Parry, an IT whiz who served here before we came, for the Fort Lauderdale Mission that provides us with some wonderful tools and reports that are not available through the Church’s software. Last transfer – the first one without Elder Steimle guiding me – it took me four days and a number of attempts to get things almost correct. This time I managed to do it is one day and I think everything is correct. YES! The other person besides Mary who really does not look forward to transfers is Elder Beagley who is affectionately called the Car Czar. This one was especially difficult because not only were there the usual cars to be swapped around as areas were dissolved and created, but there were 5 new cars to get to the right areas, TIWI’s to be installed and get operating, and of course new drivers to instructed. He got to run around in the warm weather for 3 hours getting everything straight but he got it done and could still smile. Mary and I took care of getting the mail ready to be picked up by those who were being transferred. We have this pretty much down to a science and it goes off with few if any hitches. 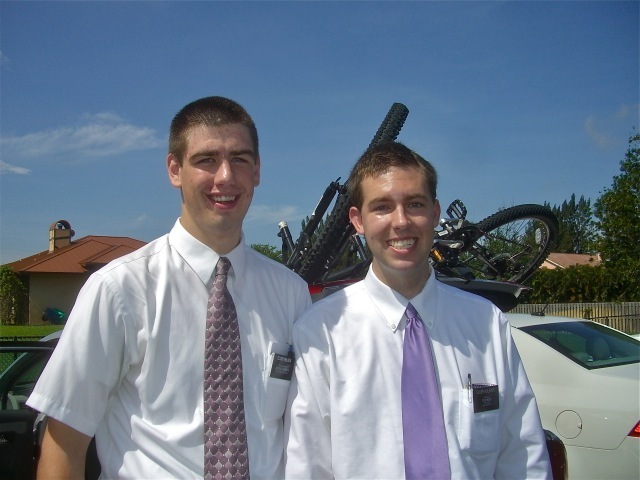 The missionaries are always eager to get mail and it is too bad that family and members can not see the big smiles as the missionaries find something for them. After this mission I am going to try to do better in writing real letters to missionaries from our ward. We did have one unusual experience this transfer. Since the missionaries who were going home went to the temple last Friday instead of on Transfer day. We had them in the office for about 5 hours with the instructions from President Anderson to try and keep them busy. Mary loved it because a group of them laminated and trimmed 280 plus cards that she normally has to do each transfer. They did it in about 3 hours where it takes us a couple of days. What I did not do is take any pictures of the missionaries at work. This was probably because I was trying to get the transfer board completed so it could be finalized. In any case there is no permanent reminder of an unusual transfer day. However I did manage to take three pictures at the chapel. 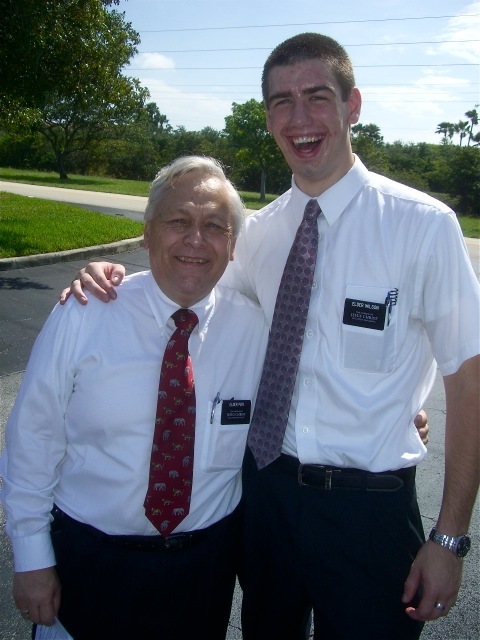 Elder Plowman has been with us in the Fort Lauderdale Zone for all but one transfer but was moved Palm Beach Zone where he will be serving with Elder Free in the Palm Beach North area. 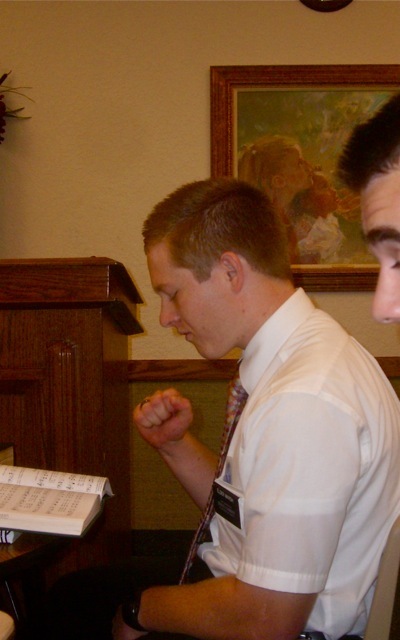 Elder Wilson was also transferred. 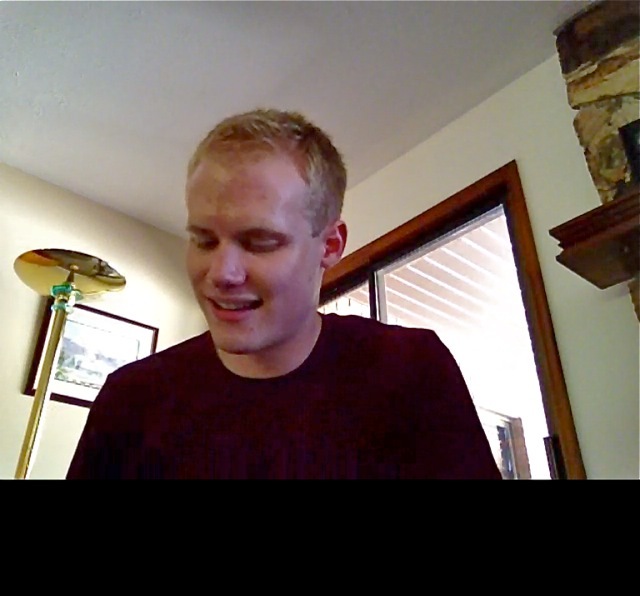 He will be serving with Elder Koleber in the Fort Pierce area of the Stuart Zone – that is as far North as you can get in the mission. He asked for a picture with me – notice I almost as tall as his chin! 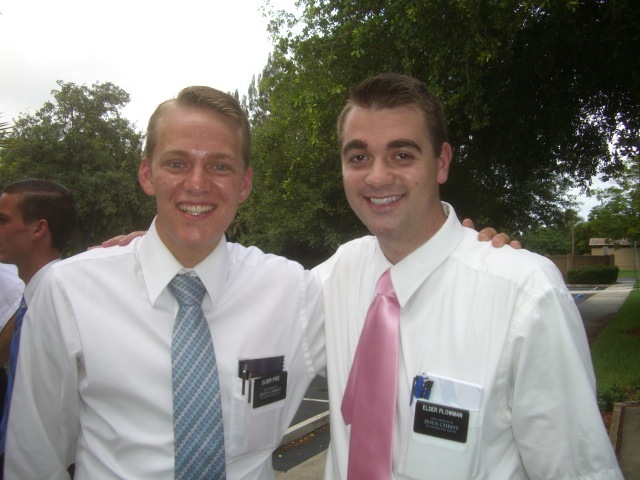 Hopefully we will get to see these two fine missionaries at some future conferences or during another transfer. 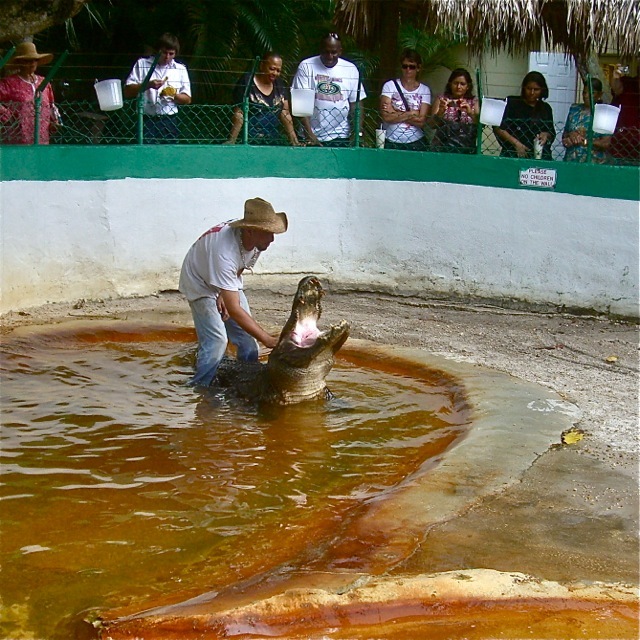 20 June 2012 – You are called to serve as a missionary…. 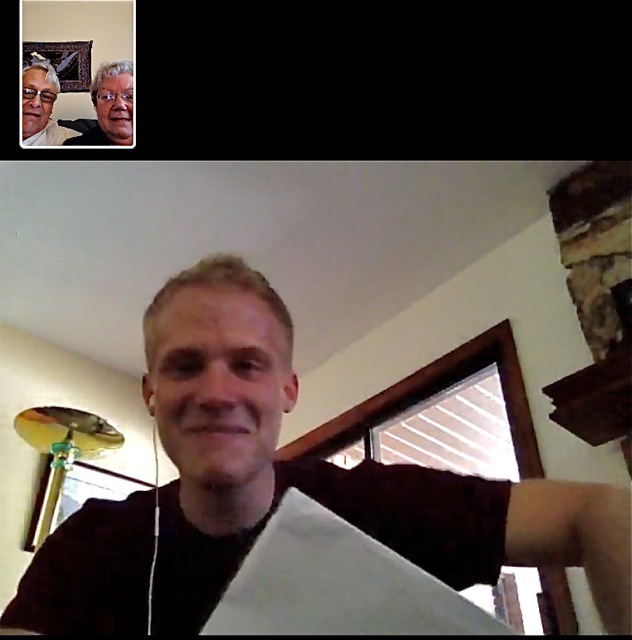 Thanks to FaceTime we were able to be a part of our grandson Shane Webb and his family as he opened his missionary call. It took some time to gather all the people and Bob kept calling to tell us that it would be a few minutes more. When the time came you could see the excitement on Shane’s face. 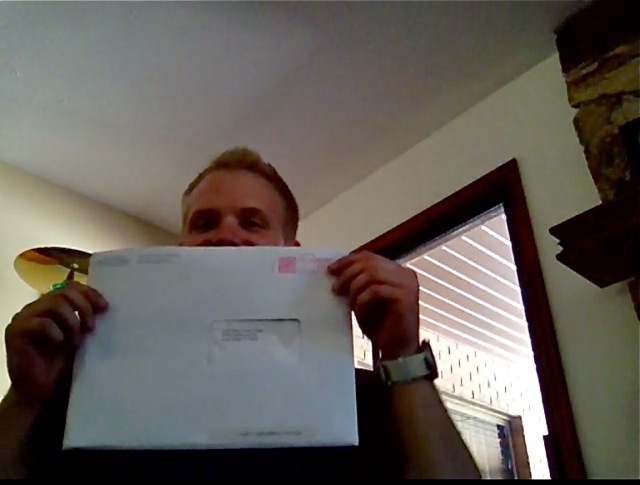 When he finally opened the envelope and started reading the call he got choked up with the spirit. He will report to the Provo MTC at the end of October and after three weeks he will travel to the Spain MTC before reporting to the Malaga, Spain mission. 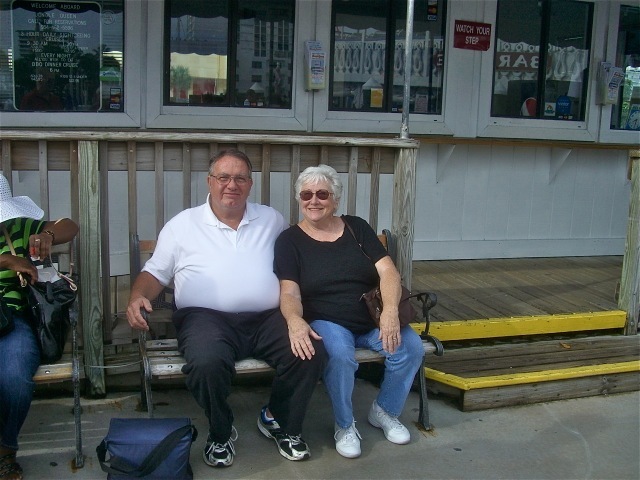 His mother, Lisa, was the only one to guess the correct mission – but then mothers have always have a special connection to the spirit when it comes to their children. The famous envelope waiting to be opened. Tears came to his eyes as the full emotion of opening his call becomes a reality. Then the smile as the feeling of peace fills his heart. He will be a great missionary. 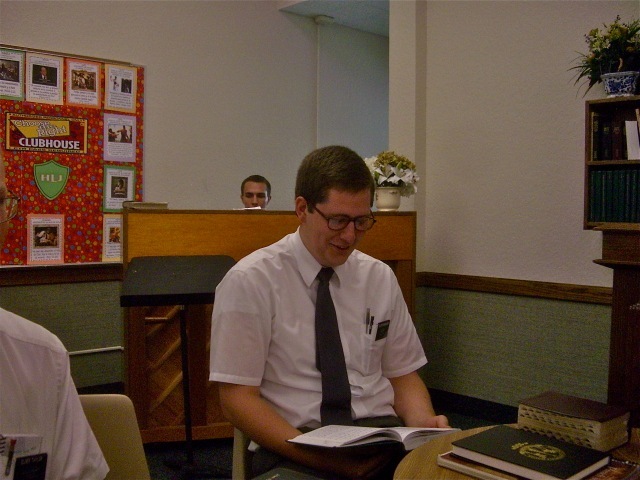 Of course I once again told him to read and study Preach My Gospel…we will see if he does it. Congratulations Shane! 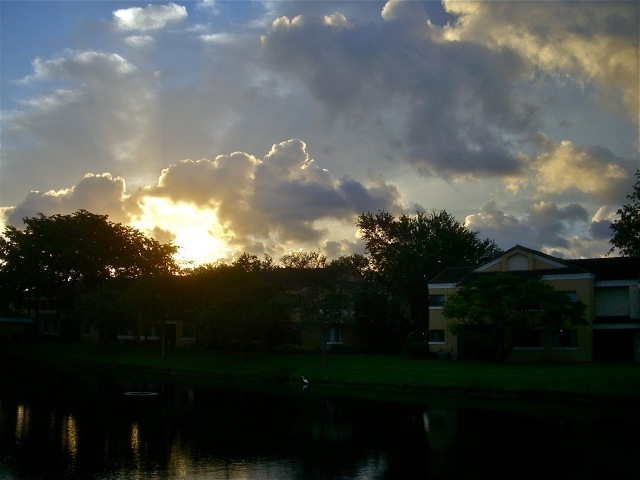 This entry was posted in Fort Lauderdale Mission on June 20, 2012 by Bill. When I opened the shades this morning I saw a beautiful sun accented sky and I had to try and capture what I saw. The pictures can not of course duplicate all the beauty but it gives an idea of nature’s wonderful landscape. Later when we walked out to the car we found that we were parked under a tree full of beautiful white blossoms, so I got out my trusty camera for more memories. 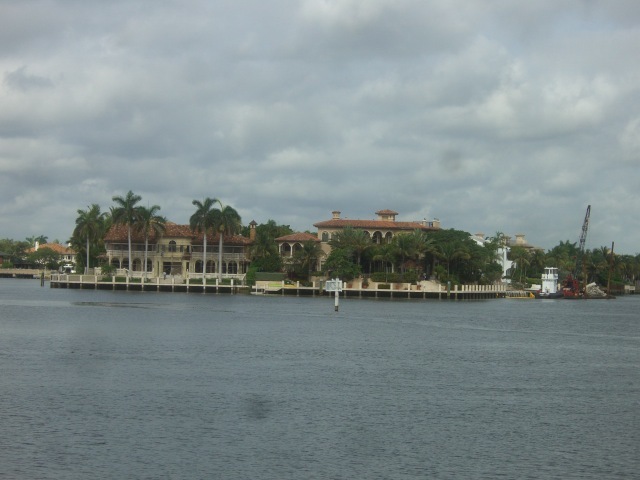 Later that morning we had the opportunity to attend the Fort Lauderdale District Meeting and I took some more pictures. I can not surprise the elders because when I turn on the camera it makes a very distinct sound and they all know what it means. But I still got a few good shots. You can tell by the smiles they know that I am taking their picture. Elders Rippstein and Fitts on the left are the zone leaders – a great pair of missionaries. 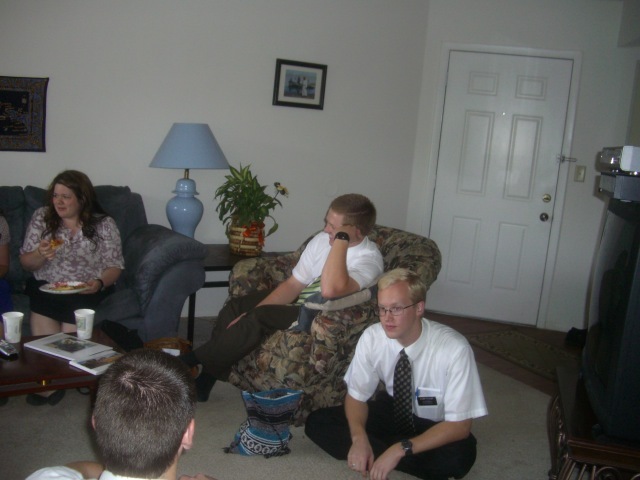 Elder Rasmussen is the close one and Elder Conger, the district leader and Elder Rs companion are in the middle. Elder Marsh is well represented by his companion Elder Plowman gets only a nose in the picture because his pose was so strange I could not include it. I wish every parent could sit in on one district meeting with their son or daughter. They would understand why they are having such an amazing time inviting others to come unto Christ. They truly are above average missionaries and we are blessed to serve with them. I pondered the idea of being ‘swallowed up in the joy of his God’ and if I had ever felt that way. What do I need to do to feel as Ammon did? The other scripture came from Alma’s soliloquy about how he felt and what he taught in Alma 29:3. I think there are two lessons here. First there is the idea of being content or patient with my callings and opportunities to serve. But also the idea that I should be diligent in fulfilling those callings and opportunities to the best of our ability. It would do no good for me to be an angel if I did not use the opportunity to the fullest. “Many are called but few are chosen,” seems to me to something that I need to consider. 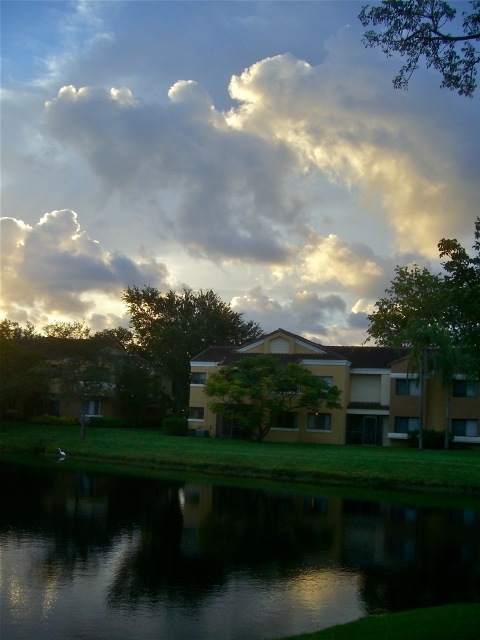 This entry was posted in Fort Lauderdale Mission on June 16, 2012 by Bill. I know the Lord will bless us directly and indirectly as we show him that we are prepared to go forth with “unwearyingness” and obedience. Again in the words of the Lord “but hast sought my will, and to keep my commandments”. 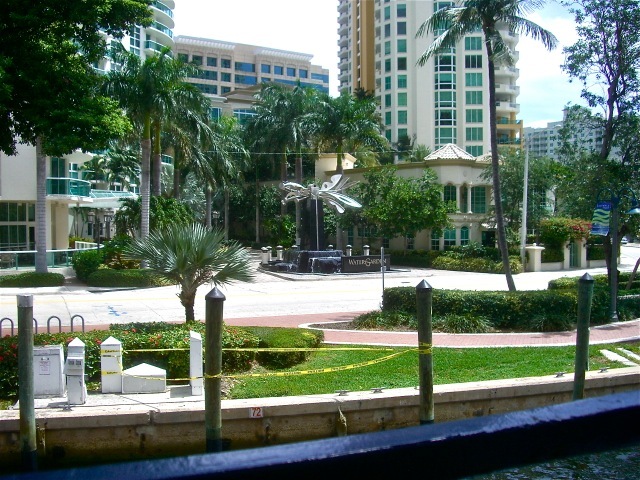 This entry was posted in Fort Lauderdale Mission on June 15, 2012 by Bill. 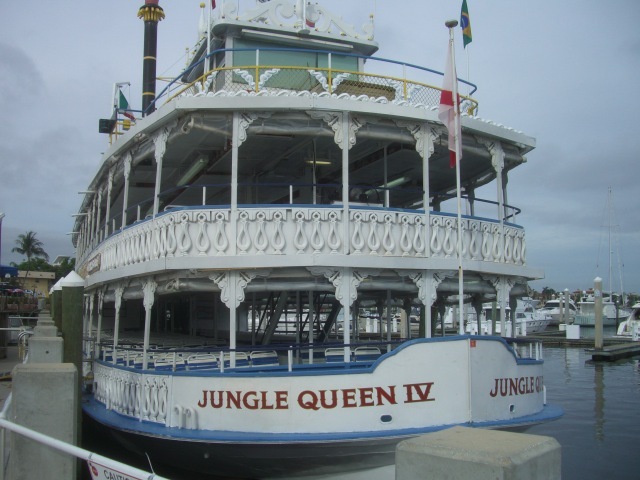 On Saturday the couples had a wonderful p-day as we cruised on a riverboat on the inter-coastal waterways. 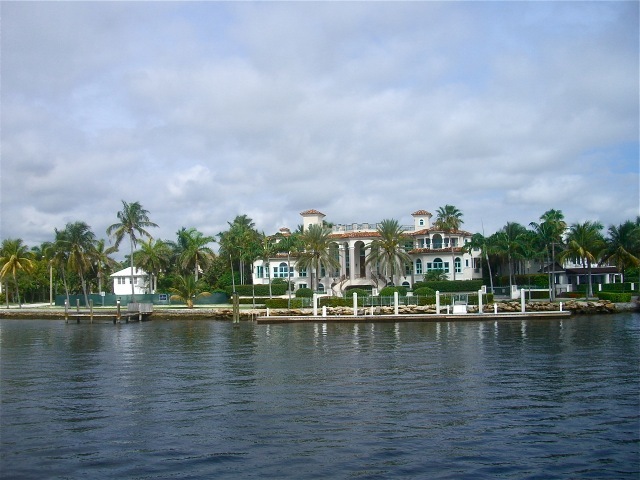 We enjoyed seeing beautiful yachts and even more beautiful mansions all along the way. 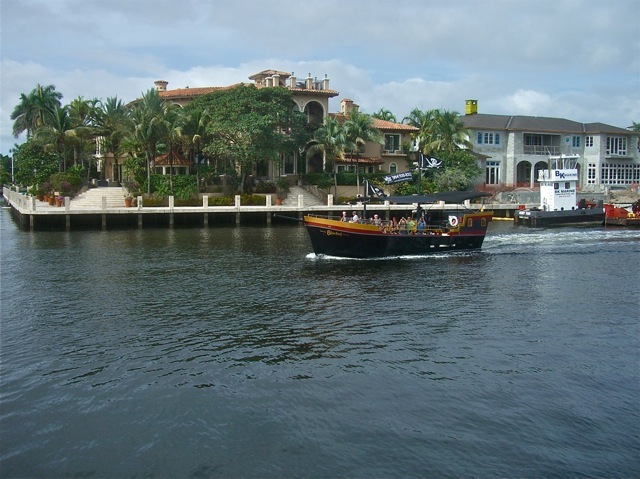 But we also saw some smaller homes and smaller boats. Our trusty ship with all natural air-conditioning. 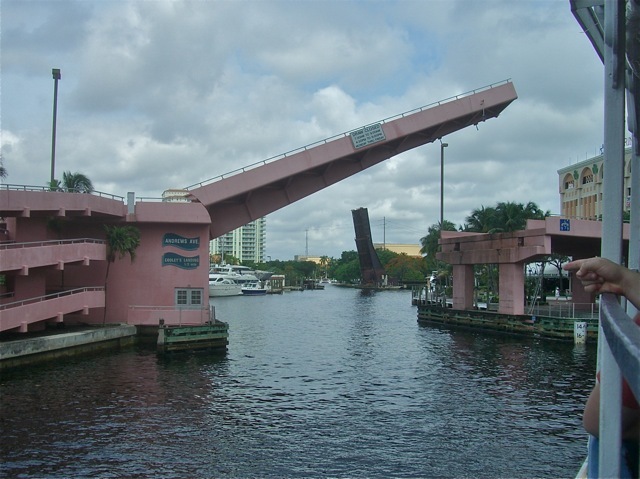 E/S McCormick serve down in the Keys and their backdoor is just a few feet from the canal. 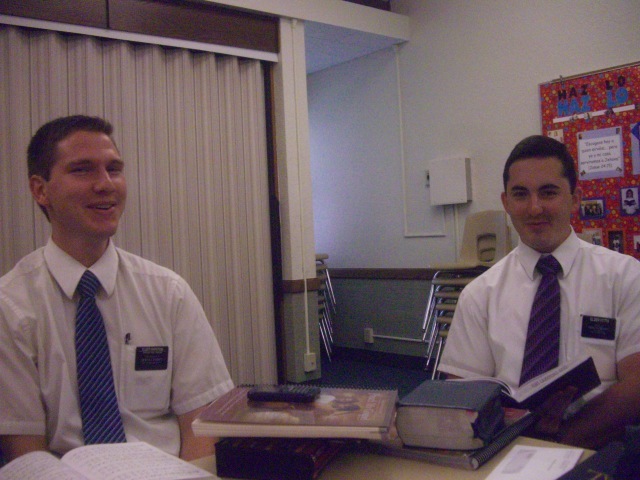 Elder McCormick retired from the navy so they are use to being on ships. The Collins are a fun couple who served 2 years as full time service missionaries before getting called for another two years as set apart missionaries. They take very good care of the apartments. The first two pictures are E/S Evans who not only are the Family History missionaries but also help with the mail, apartments, cars and anything else that needs doing. The far right picture shows E/S Beagley and Sister Sommerfeldt. Sister S is the mission nurse and is kept very busy. Elder B is the Car Czar while Sister B tries to keep the baptisms recorded properly. There are times when she needs a Urim and Thummim to translate what the missionaries send in. 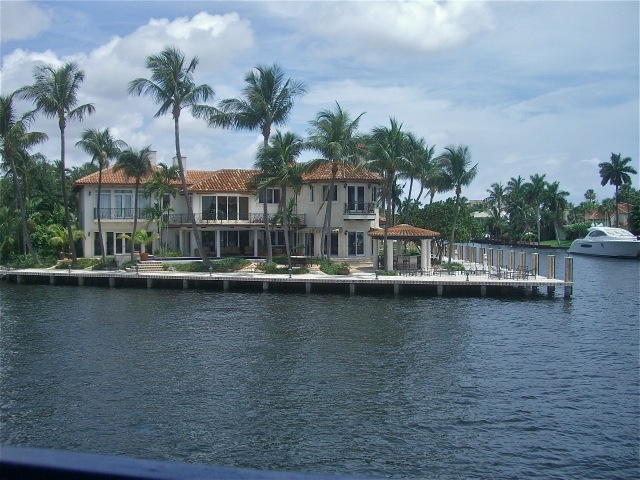 We saw many multi-million dollar mansions along the waterway. Many of them are not in use all the year but are there when their owners want to drop in. 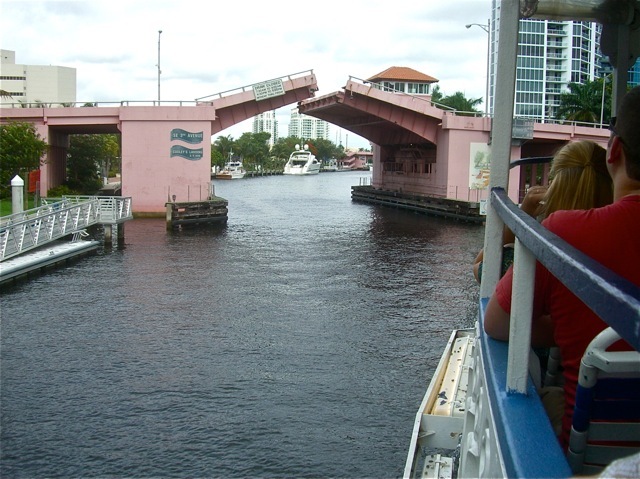 We got to go under 4 drawbridges going and the same 4 coming back. Most of them have artwork on the columns. I would like to have this piece of art in our yard…if I could find some place to put it. 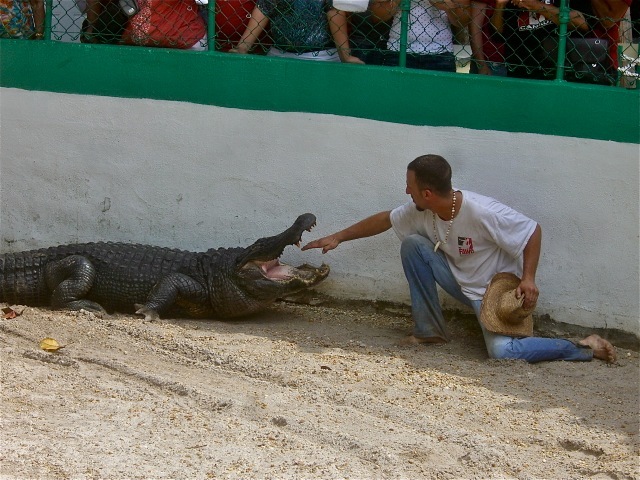 We stopped at a tourist area where there were lots of birds and an alligator act. 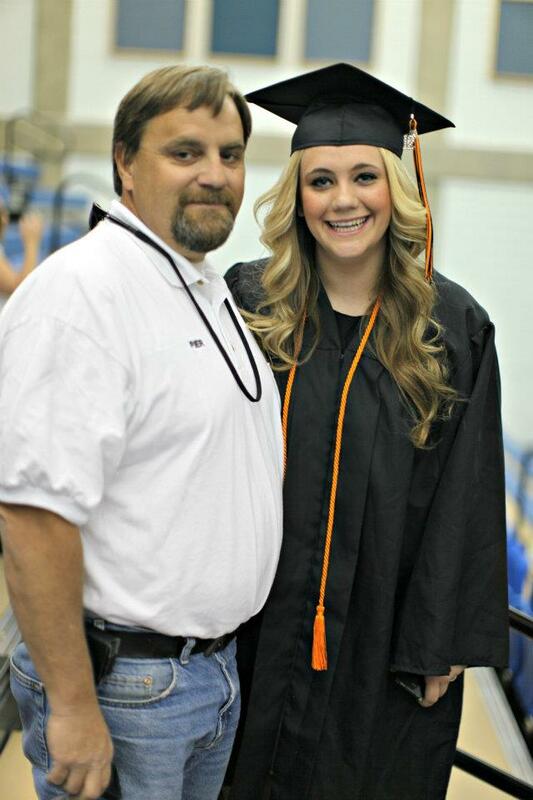 The man who put on the show knew exactly what he could and could not do. 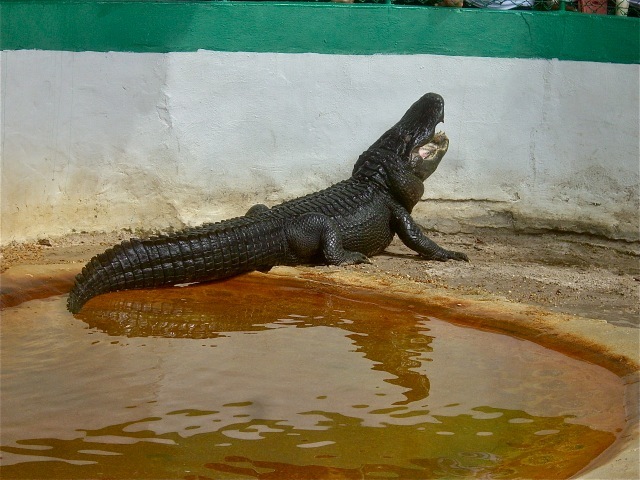 However there is little room for error as an alligator can close that big mouth so quickly you can not see it happen but can certainly hear it slam shut. There were many beautiful sights along the way and some very interesting ones also. 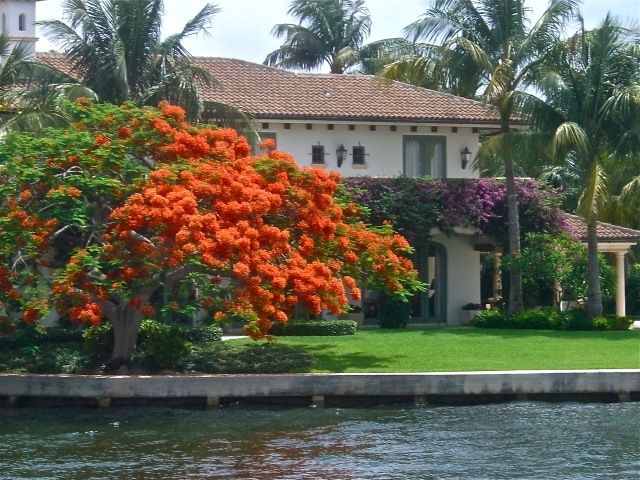 The Royal Poinciana are in full bloom – I liked this shot because of the beautiful bougainvillea in the background. The pirate cruise went by as did this smaller boat with a dog as first mate. 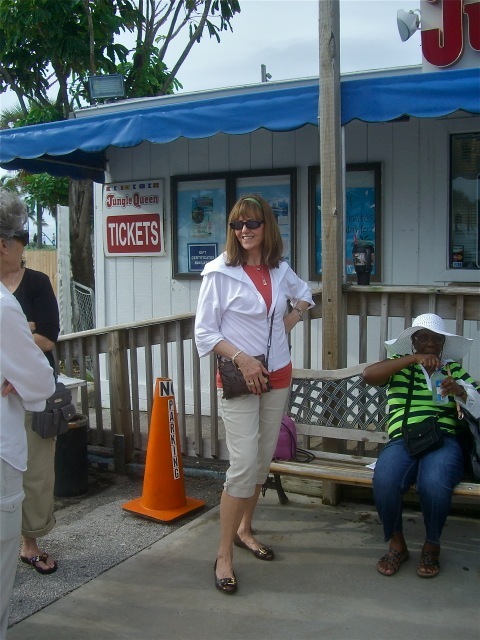 We saw lots of yachts of al sizes. 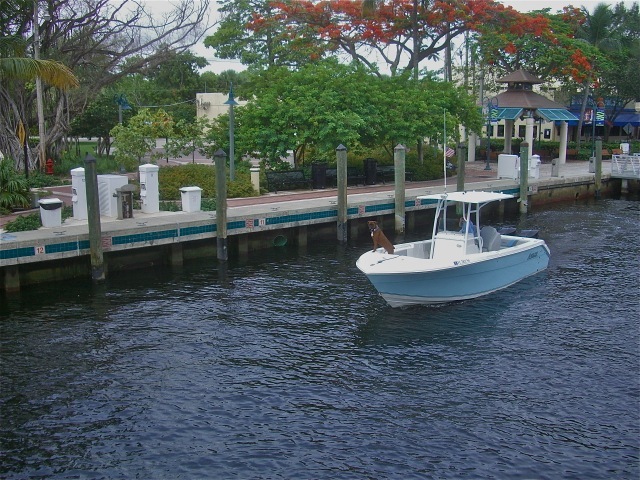 The guide said that it could cost up to $70,000 just to fill the fuel tanks on a large yacht. But I guess if you can afford the cost of the yacht, you can afford the fuel to run it. 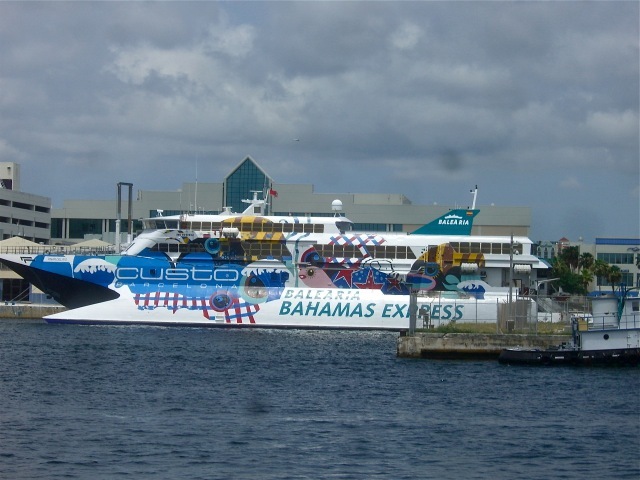 The Bahama Express makes a run to the islands and back in one day. We are trying to figure out how to ask President Anderson to let the couples use a p-day to make the trip. I suggested we say we would look for apartments for the missionaries in case the Church decides to make them part of the mission again. 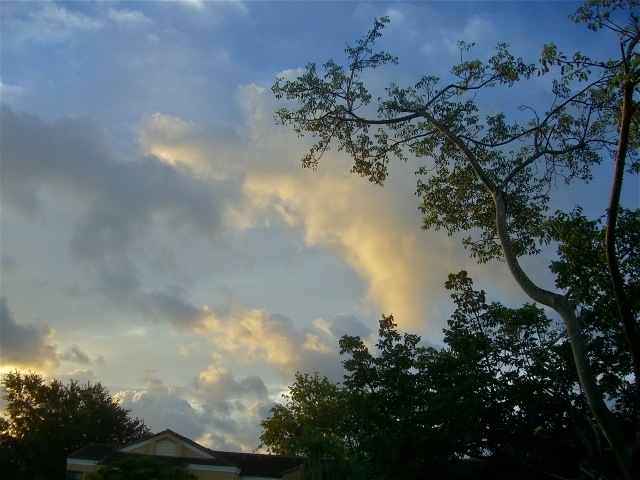 This entry was posted in Fort Lauderdale Mission on June 12, 2012 by Bill. Sunday – a day for learning and pondering. It has been a very special Sunday for me. I read from Alma about how Ammon brought the gospel to the Lamanites by first getting king Lamoni’s attention and awakening his interest in knowing more before he started teaching Lamoni the gospel plan. It is exactly how president Anderson has taught the missionaries here. Develop a desire in their investigators to learn before they start teaching. I then watched an interview with Elder Bednar where he mentioned that he had learned what it really means to fast from a sister in Africa. 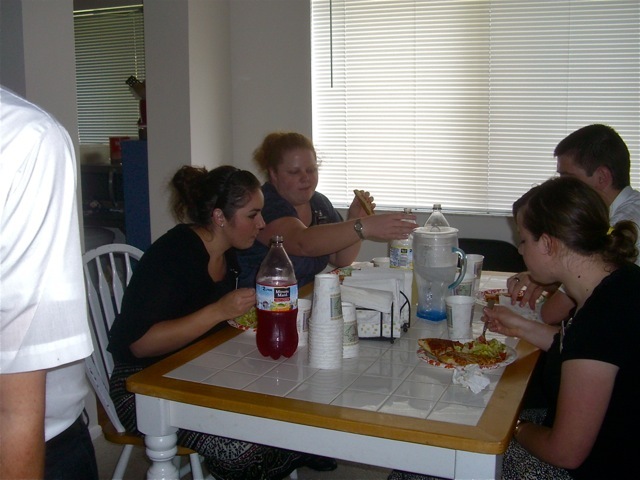 She was a recent convert and was teaching a lesson on fasting to a group of women who considered it a good day when they had one decent meal. Her simple comment that fasting was not going without food when you did not have any but purposely not eating when there was food available. After that I read an article about an 18 year old woman who was abandoned by her parents and was adopted by a school and community. She has a full ride scholarship to Harvard. But the amazing part is her attitude. She still loves her parents but does not like the choice they made. People who have heard her story has sent her money but she gives it away because she has a job and feels there are people who need it much more than she does. There is much for me to learn from her. Then we went to church and brother Perez, who with his family will be moving to New Mexico tomorrow, bore his testimony before his recently returned missionary daughter gave her home coming talk. He said something that I had never thought about nor have I heard it suggested before. He said that through a personal spiritual experience that he did not feel he could share, he knew that in our pre-mortal life we saw the Savior being born, grow up, atone for our sins, be crucified and then be resurrected. It was only because of the veil that we must pass through that we can not remember this. But we can gain a full testimony of these truths through the administering of the Holy Ghost. All of this and it is only 2:30 … I wonder what more I will learn before the day is over. 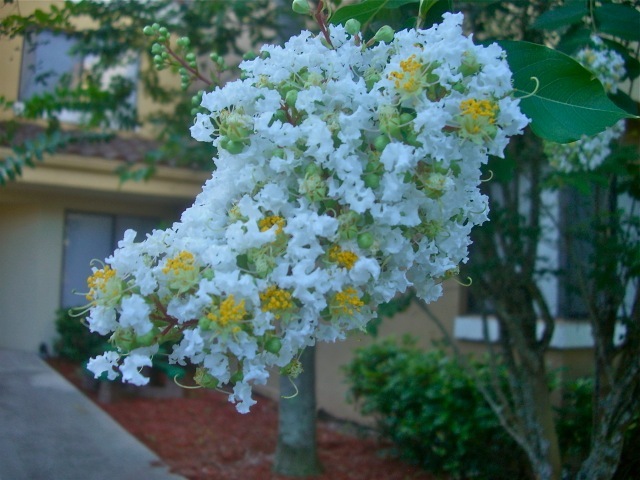 This entry was posted in Fort Lauderdale Mission on June 10, 2012 by Bill. 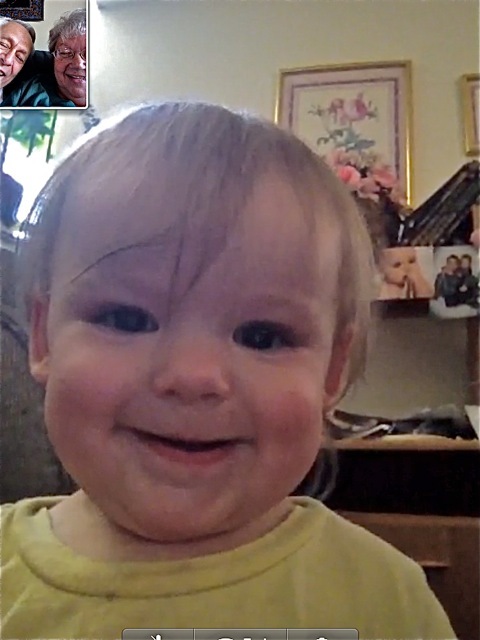 We often talk about how we are blessed to be serving our missions at a time when our children and grandchildren are only a phone call, an e-mail or a FaceTime away. Of course that is not the same as actually being there and watching them open presents, get diplomas, or holding them. However it is a lot closer than those couples who not many years ago left for their missions and the only contact they had for 18 months or 2 years was through the mail and physical pictures. Sierra Rose smiles for us. Colin tries to figure out who those people who he has never seen in person might be. A great picture of three of our favorite people. 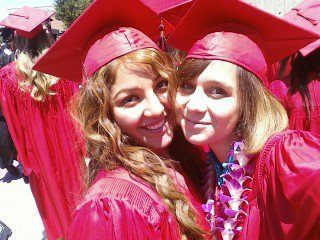 Once again we missed some graduations – we have been away for all five now. 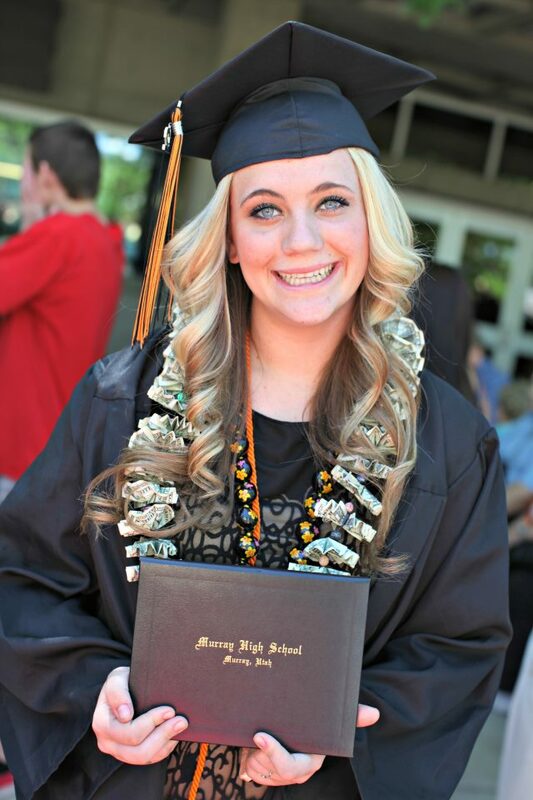 But we are just as proud of Krista, McKay, Shane, Tyler and Taylor as we would be if we were there. Maybe we will make it for their graduations from college. A quiet week…for us at least. 300-400 cookies for one week. This is on top of making potato salad for 50 people, dinner for 10 missionaries that were transferred in to the country and any number of other activities that they are invited to or volunteer for. But the important thing is that they love it and would have it no other way. I think Sister Taylor was born with a mixing spoon in her mouth and Elder Taylor with his nose to a grindstone. What great missionaries. this is their fourth mission in about 7 years and we are proud to call them our friends. 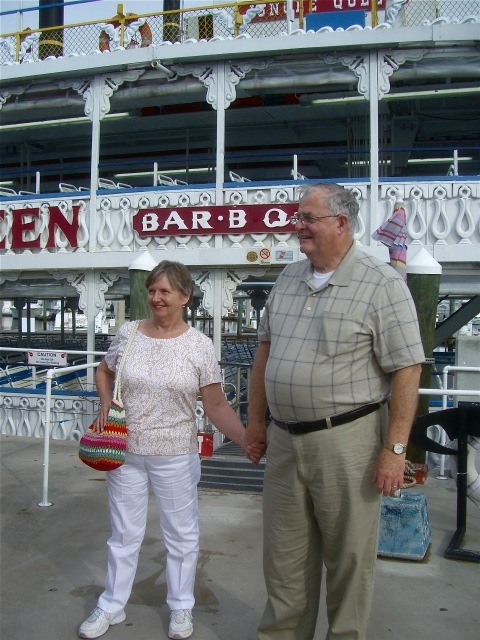 This entry was posted in Fort Lauderdale Mission on June 8, 2012 by Bill.